182 pages | 4 B/W Illus. This ground-breaking collection features the diverse voices, experiences, and scholarship of cross-cultural women of American Indian, Asian American, Black/African American and Hispanic descent at various levels of academe, actively engaged in the advancement of marginalized groups in the U.S. and abroad through their scholarly work. Intergenerational cross-cultural scholars manifest a literary community that models ways in which women scholars can move beyond traditional institutional, psychological, and professional barriers to practice activism, break unwritten rules, and shatter status quo ‘business as usual’ practices in the academy. 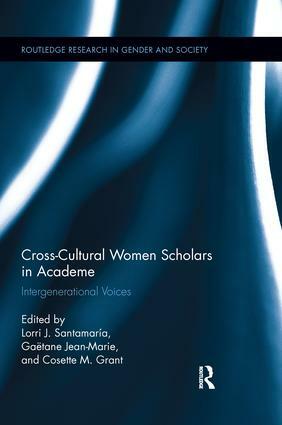 This distinctive volume exemplifies the phenomenon of cross-cultural women scholars conducting research and writing about ways in which they negotiate their professional realities toward professional goal attainment. Each chapter presents rigorous ethnographic research complemented by critical analyses, reflecting ways in which these self-determined scholars transcend barriers associated with the dynamic intersections of race, gender, ethnicity, class and language in higher education. Scholars share strategies for institutional, psychological, and professional barrier transcendence through various approaches such as educational leadership for equity, the practice of cross-cultural competence, various mentoring interactions, and the creation of and participation in networking groups with other women of color in academe. Students, academics, educational practitioners and individuals seeking exemplars for ethnographic research will find this critical book essential as a means for better informing their scholarship. Lorri J. Santamaría is Assistant Dean of Postgraduate Education and Educational Leadership Faculty at the University of Auckland, New Zealand. Gaëtane Jean-Marie is professor and chair of Leadership, Foundations & Human Resource Education at the University of Louisville. Cosette M. Grant is Assistant Professor of Educational Leadership at the University of Cincinnati and a member of the graduate faculty. The social sciences continue to be transformed and enriched by analysis which takes gender, and the ways in which gender and society interact, to be of vital, defining importance. This series is new and broadly based, and will publish high-level contributions from across the disciplines.